11986: Astoria miniature safety: black hard rubber ringtop with Italian 18K gold filled filigree overlay, 7.8 cm long, Astoria-marked 14K nib; true filigree work in this case, with beaded wire, excellent quality, must be examined closely for full appreciation. Seals have not been replaced, not ink-tight. 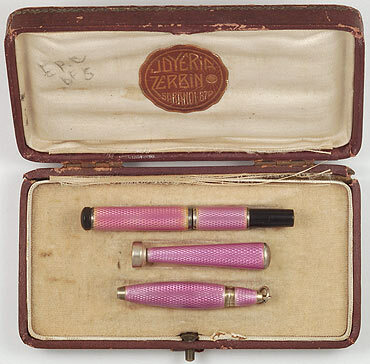 13413: Eric 29: large mottled hard rubber safety, made in England for the French market, 12.2 cm long, comparable in girth to a Waterman 45; crisp imprints, "ERIC"-imprinted 18K gold nib opens with very light pressure, tooth on rougher paper. 13208: Gold Starry safety: black chased hard rubber, made in France, 9.8 cm long, crisp and glossy, strong imprints, 18K warranted nib may be an old replacement. 13421: Gold Starry (?) No. 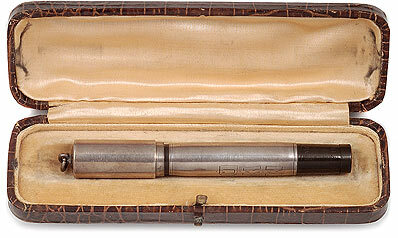 3: large black chased hard rubber clipless French safety, 13 cm long, 18K warranted nib; barrel imprint worn and largely illegible below the first line which reads "HACHETTE'S" -- surely a retailer's imprint, for the famous Paris publisher and stationer; comparable in girth to a Waterman 45. 13427: Tacos safety: mottled hard rubber, 12.15 cm long, made in France, sharp barrel imprint, 18K nib also imprinted; excellent but for crack just beginning from nib vent hole (see detail), should be stable if nib used with a light touch and not aggressively flexed. 11063: The King safety: black hard rubber with 18K gold filled overlay, 11.25 cm long, Waterman-style, Italian manufacture, excellent quality, engine turning crisp, some light bumps to edge of cap crown, replacement warranted nib is a responsive writer, smooth and calligraphic. 12713: Uhlmann Eterno: black hard rubber Italian safety, 18K gold filled overlay, 10.85 cm long, fully marked on cap and barrel, nib has nice flex but tipping is scant and rather draggy. 13648: Waterman 412S Filigree: early black hard rubber safety with sterling silver overlay, 12.8 cm long, threaded turning knob, early mechanism with helically-grooved barrel interior, nib turns as it is extended and retracted, #2 New York nib has some spring but not true flex, feed with patent imprint. Some flattening to the cap crown, no trace of a number imprint on the turning knob, seals have been replaced. 13295: Waterman 12½VS Baby: vest pocket size black chased hard rubber clipless safety, 8.9 cm long, strong imprints and chasing, moderate even fading, one tiny fleabite to cap lip. 4291: Waterman 0512½VS Baby: smooth gold filled overlay safety with rare double cap; 9.3 cm long, has been recorked, turning knob fully marked, virtually no plating wear, but inner cap rim dinged and wavy (see detail), barrel engraved with name. 12972: Waterman 42½: black chased hard rubber slender full-length clipless safety, 12.8 cm long, crisp and glossy, bold imprints, only slightest fading, lively springy #2 New York nib, tiny fleabite to edge of cap lip (see detail). 11034: Waterman 41: rare woodgrain red and black hard rubber slender clipless safety, 11.45 cm long, crisp and glossy, original cork seal has not been replaced but appears to be ink-tight; appears never to have been filled, later Waterman nib may indicate closeout model, assembly from new old stock parts.